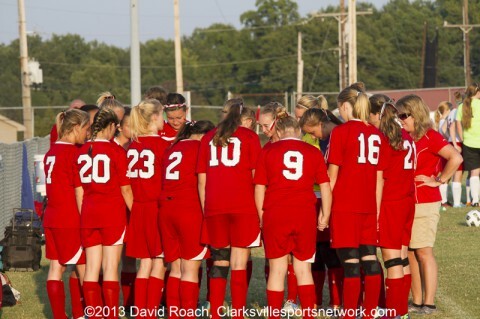 Charlotte, TN – Fairview High School’s Erika Suhrbier recorded a hat trick, Thursday, October 17th in the finals of the District 11 A/AA soccer tournament held at Creek Wood High School, to upset the tournament’s number one seed Montgomery Central 5-0 and end the Lady Indians 15-game win streak. Montgomery Central (15-2), who was looking to win its first district tournament title since 2003, hadn’t lost a match since a 4-0 setback to open the season back on August 20th to West Creek High School. The Lady Indians didn’t help themselves early on, as Central was called for a foul just outside the penalty in the 13th minute giving the Yellowjackets a free kick. Suhrbier blasted shot just inside the left post that Montgomery Central starting keeper Sara Jackson got her hands on, but she wasn’t able to keep the ball from going through her hands and into the net for a goal and a 1-0 Fairview lead. Three minutes later, Fairview (13-7) would benefit from an own goal by the Lady Indians, as a corner kick by the Yellowjackets was headed into the net by a Central defender. Fairview was score its third goal of the first half in the 22nd minute on another free kick following a Central foul, this time Morgan Mooney converting the kick for a 3-0 Yellowjackets lead. It was still 3-0 as the two teams started the second half, when a questionable call in the 49th minute gave Fairview a penalty kick when Central’s keeper Allison Schmittou and Suhrbier got tangled up near the top of the penalty box. Suhrbier converted the penalty kick and the Yellowjackets led 4-0. The final goal of the night was also by Suhrbier – her third of the match – also coming on a free kick in the 53rd minute. Despite the final margin, Montgomery Central dominated for the most part statistically, as the Lady Indians outshot the Yellowjackets 17-7 and in shots on goal 15-7. Fairview did hold an 11-6 advantage in corner kicks. Fairview’s keeper Anika Sutter recorded 15 saves, while Central got a save each from Jackson and Schmittou. Montgomery Central will now have to go on the road for its first Region match, October 22nd, as the travel to the winner of the District 12 A/AA tournament finals between Christ Presbyterian Academy and Page High School.